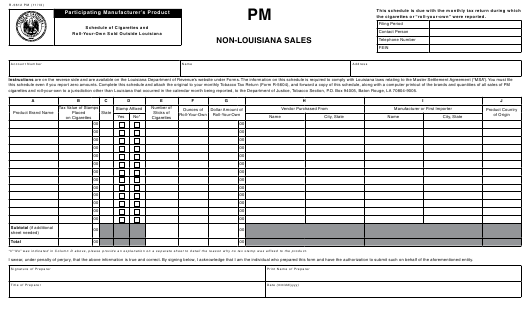 Form R-5612 PM or the "Participating Manufacturer's Product - Schedule Of Cigarettes And Roll-your-own Sold Outside Louisiana - Non-louisiana Sales (pm)" is a form issued by the Louisiana Department of Revenue. The form was last revised in November 1, 2013 and is available for digital filing. Download an up-to-date fillable Form R-5612 PM in PDF-format down below or look it up on the Louisiana Department of Revenue Forms website. month being reported, to the Department of Justice, Tobacco Section, P.O. Box 94005, Baton Rouge, LA 70804-9005. AND affix tax stamps in both Louisiana and other tax jurisdictions.